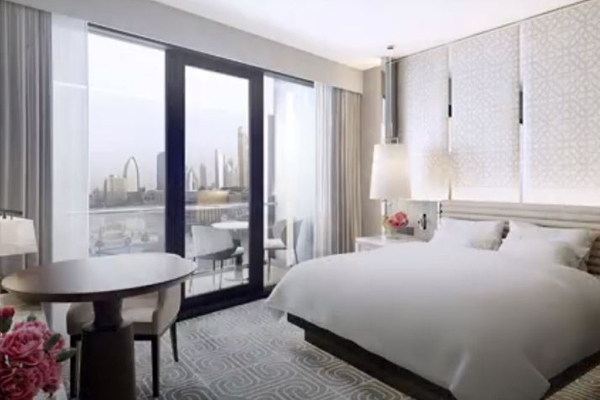 Emaar Hospitality Group, the hospitality and leisure business of global developer Emaar Properties, welcomes guests to the boldly reimagined Address Dubai Mall, the five-star hotel linked directly to The Dubai Mall. With a new look and sparkle, the all-new Address Dubai Mall redefines premium luxury with its ultra-modern hotel rooms and suites, exceptional dining concepts and avant-garde wellness facilities. The facelift comes closely after the ninth anniversary of Address Dubai Mall, which was officially inaugurated on September 9, 2009. The renovation of the hotel was undertaken over the past few months with the new design spanning the welcome entrance, lobby, hotel rooms and suites, the restaurants, fitness centre, and Qix, the children’s club, among others. Alongside, there have been spectacular new additions that will delight visitors, who value the hotel for its proximity it offers to the varied lifestyle attractions in Downtown Dubai. With the entrance to sport a new design, the lobby is now more contemporary, reflecting sophisticated elegance, and complementing the hotel’s appeal to the fashion-lovers who revel in retail therapy at The Dubai Mall. Vitrines featuring high-end brands add to the fashion quotient and offers another opportunity for retailers in The Dubai Mall to build their brand engagement with the visitors. The rooms take on an inspiring new look and feel with lavish furnishings adorning them. Best-in-class amenities, from mood lighting to touchpad switches assure a superior lifestyle befitting the individuality of the guests. Private balconies open to mesmeric views of the city’s finest sights, from Burj Khalifa to The Dubai Fountain. Guests can choose from 244 rooms and suites including Deluxe Rooms, Premier Rooms, Premier Suites, Club King Rooms, and Suites. Address Dubai Mall also features the Address Residences Dubai Mall – 449 serviced residences in all – including impressive studio, one-, two- and three-bedroom apartments as well as magnificent two-bedroom penthouses. Residents have access to exceptional dining experiences, an award-winning spa and a modern Fitness Centre, and a dedicated entrance to The Dubai Mall. Soon to open doors is the Club Lounge, an elegant retreat exclusively reserved for guests of Club Rooms and Suites, who can enjoy complimentary meals and an assortment of invigorating beverages throughout the day in stately dining and lounge-style areas. Address Dubai Mall is also home to one of the largest open-air lap pools in Downtown Dubai, the allure of which is enhanced by the exotic pool-side restaurant, Cabana, which will welcome guests shortly. A dedicated splash pad for children and private cabanas ensure that families have ample opportunity to revel in quality time together. A vast sun-lounging deck provides a marvellous vantage point from which to admire views of Burj Khalifa ahead and the magnificent city beyond. Located on Level 3, Qix, the wonderland for children up to 12 years of age, has been revigorated to provide young guests a variety of creative and engaging activities such as craft sessions, educational games and more. A qualified team of professionals assures careful supervision, assuring parents a well-deserved opportunity to enjoy the hotel’s finest amenities. The Fitness Centre has advanced equipment that caters to most training styles and is open 24 hours a day all through the week. With Address Dubai Mall having served as the first choice for meetings and events, the renovated hotel will offer even more conveniences. Beautiful aesthetics and flawless functionality merge seamlessly across the meeting and event venues that will be ready soon to welcome guests. The Diamond Ballroom can be converted into three individual spaces for corporate events, gala dinner and elegant weddings, while the purpose-built Meeting Rooms are equipped for all business needs. Adding to the choice of Address Dubai Mall as one of Dubai’s definitive wedding venues is a Bridal Sales Centre, that serves as a preview showcase, and a VIP multi-purpose room, ideal for the bride or bridal party to prepare for the reception. The hotel’s events team will assist guests with all details – from delivering a multi-tiered wedding cake to exquisite floral arrangements and more. The Spa at Address Dubai Mall will have an elegant new look and assure the blissful experiences of refinement and rejuvenation that nourish both mind and body. The Spa will feature 15 treatment rooms – some of which are now open – as well as hydrotherapy facilities, steam rooms, hair & nail studio, and relaxation areas. Address Dubai Mall will also offer special retail packages for guests, who will also have the opportunity to explore a diverse range of leisure attractions in easy walking distance including access to At the Top, Burj Khalifa; Dubai Aquarium & Underwater Zoo; the VR Park and Reel Cinemas, among others. Members of U By Emaar, the customer-focused loyalty programme designed by Emaar Hospitality Group, in association with Emaar Entertainment, will assure unprecedented value. They stand to gain special benefits across 55 of Emaar’s award-winning hotel, F&B and leisure brands.